Publisher’s Notes: This Featured Artist post is near and dear to my heart for a number of reasons. 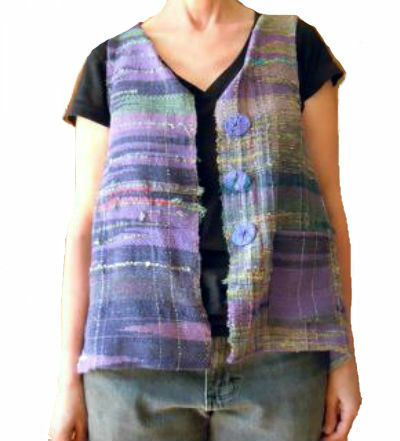 Karen Pardee of Serendipity Saori Studio is a fiber hero of mine AND she lives in a part of the United States that is both beautiful as well as an area where I have roots and am connected. I know that you will enjoy reading about Karen and what led her to study and embrace Saori. It is with great pleasure that I present Karen’s interview to you this week. Spin Artiste (SA) I know from reading your website that you have a long history of making things by hand. What led you to enter into the world of Saori and to commit yourself to it? Karen Pardee (KP): Second chances don’t happen very often. An illness provided the wake-up call I needed to do a lot of soul searching and realize somewhere along the way I took a fork in the road and wandered down a dead-end path. Life is too short; I needed to be true to myself and re-create the life I wanted to live. SA: Tell us about your progression as an artist from the beginning of your Saori training till now. 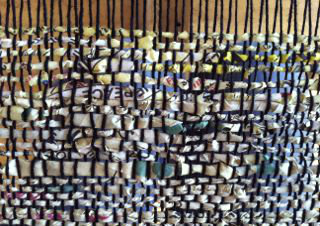 KP: My degree is in fiber arts; I wove in school, but it was mostly placemats, table runners, and hand towels. Then with my illness, I lost my short-term memory and couldn’t follow a pattern. It made me so sad to look at an empty loom that I had my husband pack it up and put it in storage. I thought I would never be able to weave again. 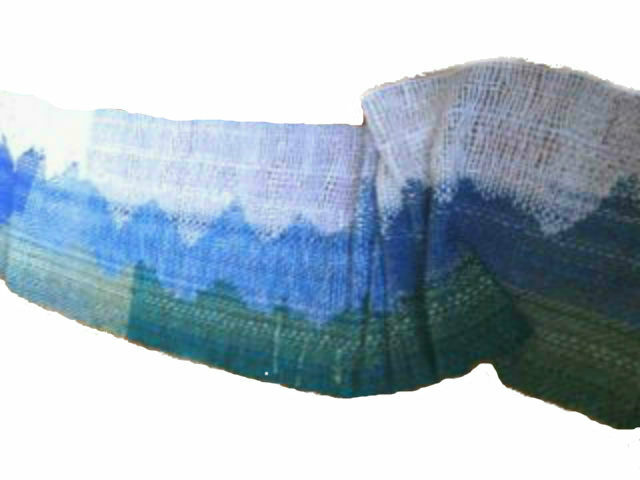 On an internet search in early 2011, I came across some Saori weaving. My eyes popped out of my head; I’d never seen anything like it! What I found even more exciting was that someone was wearing their weaving. I had to find out more: What was Saori? How could I find out more about it? Where could take a class? How far was the nearest studio? Were there other Saori weavers in my area? After more searching, I found Mihoko Wakabayashi at Saori Worcester and arranged to take an intensive class with her. Those were the longest six weeks ever (except maybe my pregnancies), so I asked Mihoko what I could do in the meantime. She suggested I purchase the Saori book and read about the founder, Misao Jo and the Saori philosophy. When the time finally came for my class, I was panting! I walked into her studio and knew Saori was what I wanted to do. I became an authorized Saori studio and equipment dealer in October 2011. For me, Saori is like a discipline you practice. The longer you weave, the more you learn about yourself, the more you are able to let go and free yourself from pre-conceived notions and ideas about how things are supposed to be. I’m just at the beginning of my Saori journey, and it’s always exciting and amazing to see where it takes me. SA: What is the biggest misconception people have about Saori weaving? 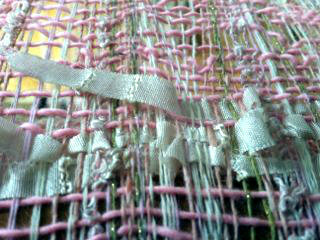 KP: The biggest misconception about Saori weaving may be that Saori is the same as freestyle weaving. But that doesn’t really give respect to Misao Jo, the founder of Saori, and the philosophy she developed of weaving as a way to discover your true self. The foundation of Saori weaving is not to do the same thing as everyone else, to be courageous enough to think outside the box, to break from common sense, to liberate ourselves from conventional concepts. We can do this through Saori weaving, and the longer you practice, the more this philosophy spills over into other areas of your life. 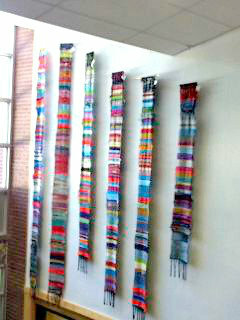 SA: What do you see as the future of Saori weaving in the United States? KP: It’s only going to grow and grow! There is an increasing older population. Men and women who have raised their families, not yet retired, or recently retired looking for a rewarding and meaningful creative activity. Several of my Saori sister studios are offering programs for people with disabilities. Saori weaving is a wonderful tool for self-expression and self-discovering, especially for those with physical and mental disabilities, especially autism. In the past a shaky economy marked an upsurge in making, whether it be knitting, sewing, or weaving. A recession provides an opportunity for inward looking, a reassessment of values, and what’s important. When people spend more and more time online in a virtual world, more and more people enjoy making things, instead of just being consumers of things. 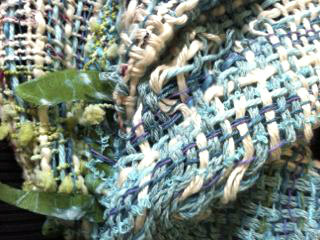 And there is a spiritual/meditative/healing aspect of weaving. 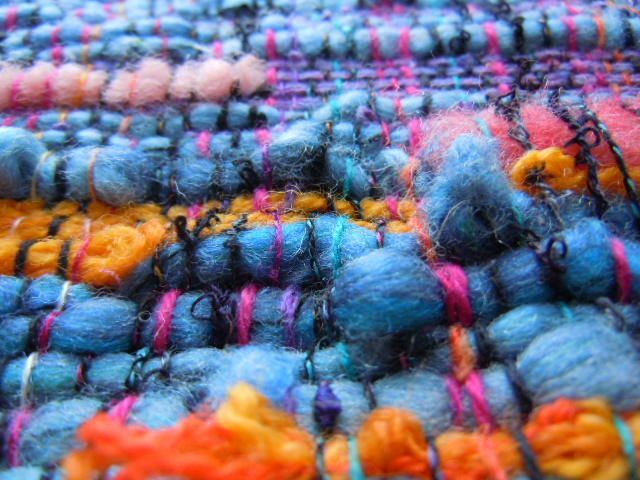 Weaving provides a way to connect with the here and now, and improves stress levels similar to mindfulness. 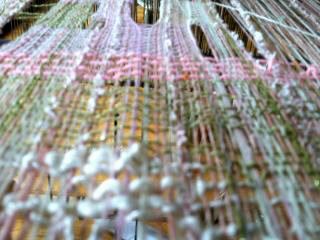 Because of the repetitive back and forth motion of weaving, it becomes very calming. You forget all the things you have to do, and are brought into what’s happening right now, at the loom in front of you. The rhythm calms the heart rate and breathing, creates a feeling of stability, and also an inner quiet. SA: Tell us about your recent experience of visiting Japan? KP: Where to begin?!!! 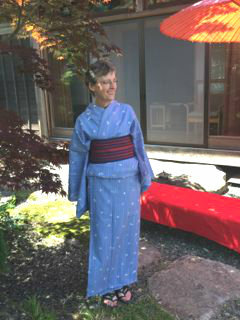 My Saori mentor, Mihoko, offers a tour every other year, and I was fortunate enough to join her tour in May. We started out in Osaka, at the Saori headquarters, Saori no Mori. 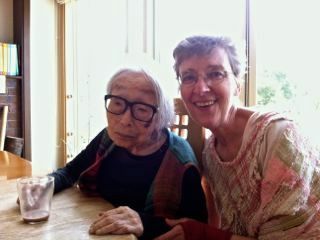 It was a dream come true to meet Misao Jo, as she turned 102 in April! I sat with her as she had her morning cup of hot cocoa. I don’t know if she understands English, but I was moved to tell her how grateful I was to her and how much Saori has changed my life. We left Osaka, and travelled by bullet train to Kyoto, Yufuin, Kakagawa, Hiroshima, Himeji, and back to Osaka, visiting several Saori studios along the way. At some of the studios, we participated in dyeing workshops, which were lots of fun. The Japanese people are so gracious, kind, and generous. Some of my favorite moments were walking through the Torii Gates (aka the Walk of Prayers), which are thousands of red gates winding up Mt. Inari in Kyoto; attending a traditional tea ceremony, visiting temples with beautiful Japanese gardens, sipping tea at the base of Mt. Yufu overlooking rice paddy fields; walking through Mihoko’s old neighborhood and being welcomed into the home of the family that lived across the street from her, staying in a traditional ryokan (Japanese inn); and going to a Japanese bath house. Mihoko was an amazing guide. We were able to experience Japan, not just looking out through a window on a bus or train; but to interact and engage with the people. I’m already planning my next visit in 2017! SA: Tell us about your own project planning process? How much intention do you set at the beginning of a project? 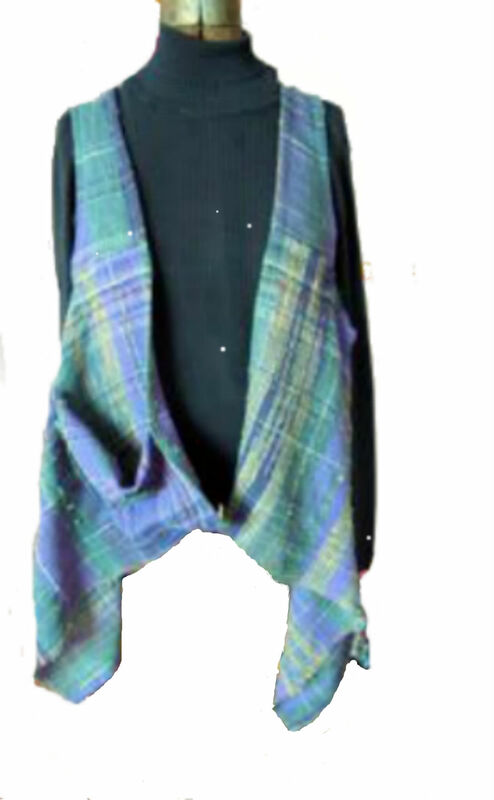 KP: In the early days of my Saori weaving, I would put a warp on with the idea I would make a particular item, say a scarf or cloth for a vest, etc. 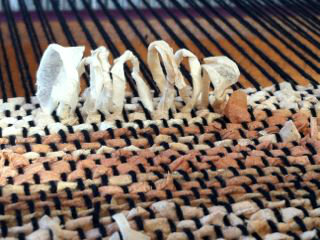 Sometimes part way through the weaving, the cloth would “tell” me that it didn’t want to be a scarf or vest. You have to be open to listening. It will tell you what it wants to be. 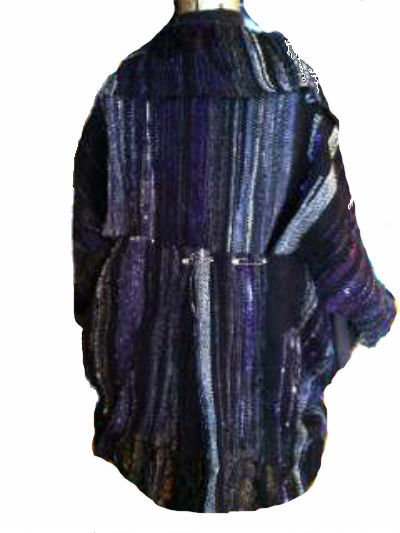 SA: Do you enjoy making garments from your finished pieces? If so, what kinds of garments? KP: I love making garments, and that’s what attracted me to Saori from the beginning. My favorites are vests; they’re so versatile and can be worn in every season. I don’t like clothes that constrict and limit movement, so vests seem to work for me. SA: Back in February, you wrote a blog post about weaving with paper and I have had my own experiences in learning to work with shifu. 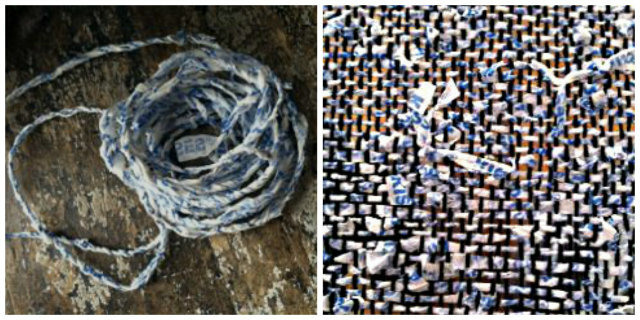 Are you still experimenting with paper in your weaving? KP: I started spinning and weaving with recycled teabags several years ago, but picked it up again this past winter after seeing Kenzo spin on the Saori built-in bobbin winder at the Saori Post-Conference. This worked much better for me than trying to spin teabags at the wheel or with a drop spindle. In fact, I got quite obsessed with paper spinning on the Saori bobbin winder. When I ran out of teabags, I looked around the room for something else to spin, until my eyes fell on the Yellow Pages. Then I moved on to spin and weave with Hershey Kisses tissue; which led to writing messages, over drawing with markers, spinning and weaving with tissue paper. 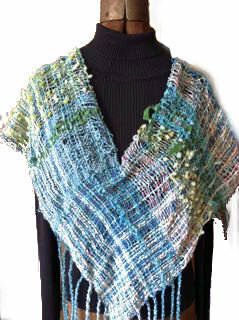 SA: Do you use handspun yarns in your work? Are you a spinner? 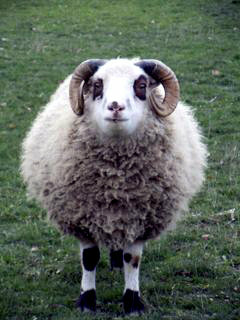 KP: I have a small flock of Shetland sheep, and consider myself a novice spinner. I had a strict instructor and became a very intimidated spinner. Every time I sat down at my wheel, I would tighten up and break out in a sweat! I did eventually learn to spin a very fine yarn to her satisfaction. One of my goals is to Saorize my spinning, to let go of preconceived ideas about what is yarn, and have fun again. SA: I noticed that you begin your blog posts with a quote. Tell us about why and how you chose the quotes. KP: Quotes are so inspiring. I’ve been collecting quotes since I was a kid and have notebooks full. On my blog, they’re good jumping off points for starting the conversation. SA: What is on your fiber “bucket list”? learn to spin cotton on the wheel. I’ve been playing with a handmade bead support spindle and also with a tahkli my daughter gifted me. But I like to be learn to spin cotton on my wheel. inspired by a recent issue of Ply Magazine, I would love a spin with some Rambouillet. continue playing with coils/supercoils, thick and thin, corespun, and art yarns from my own batts and rolags I blend on my hand cards. continue my Flax Project I started five years ago. Each year I’ve planted a small plot of flax, with the idea being to process, spin and weave a garment I could wear. SA: If someone wants to become proficient in Saori, what is the path you recommend? SA: If you were a paint color, which one would you be? SA: Thank you so very much, Karen! 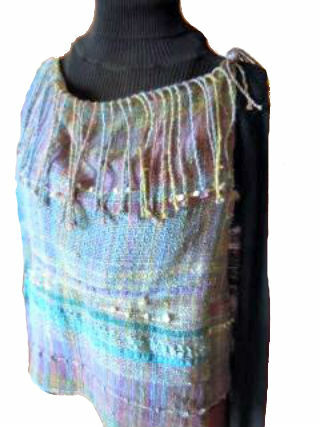 I can see your beautiful spirit in your amazing weavings. And, with this post, I’m kind of wrapping things up here with a “bang” I feel. I mentioned a couple of posts ago that pretty soon I would be posting only at www.fiberygoodness.com instead of trying to keep up with two fiber lives. I have loved writing this blog for over four years! We will be continuing in the tradition of this content as well as mixing in our other Fibery Goodness style content. We have a really fun challenge coming up in the fall that I’m sworn to secrecy on at the moment, but I promise you, it is in the spirit of the Secret Stash and Battle of the Bobbins only better!! Looking forward to your participation and support over at www.fiberygoodness.com! ← The Big Tour de Fleece Wrap Up! I loved reading about Karen’s journey. I m interested in buying a saori loom, I just need to find a space for it. Thank you so much Karen, I am an experienced weaver but am fascinated with the Saori weaving technique and am taking a class in September. This makes me even more excited. Great article! What an interesting interview! Being on my own Saori journey, I find it fascinating to hear about others’. I met Karen at the conference last summer, and was struck by her gentle manner.